Cameron Lefear, an unheralded 6-3 guard from Flint Northern, scored 16 points for Oakland City University (Indiana) last night in a loss to Butler. Lefear is probably the best “feel good” story of the year for basketball in Flint. No one, myself included, thought he would make it at the college level. He didn’t play much in high school on a very average team at Northern; clearly, however, he didn’t let that fact keep him from getting to work. Lefear, a sophomore, has started all six games this season for OCU and is averaging more than 13 points per game. I love stories like this. It reminds me of Torian Harris from several years back. He too was unheralded at Saginaw High, but he kept the basketball dream alive at Lansing CC, then at the University of Nebraska – Omaha. The next step, if he chooses that route, could be professional basketball overseas. The lesson is simple: Don’t let your circumstances dictate the realization of your potential. John Taylor does it again. 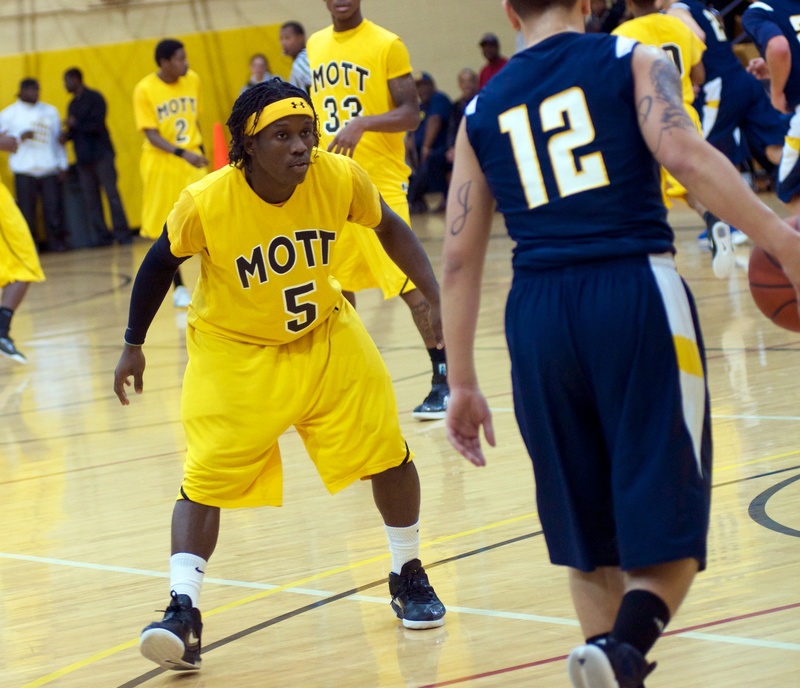 Mott’s sophomore combo guard is now averaging 32.5 points per game this season. Among players who have played at least three games, he’s the top scorer in the nation at this level. PERRYSBURG, Ohio — The No. 17-ranked Owens Express men’s basketball team couldn’t stop John Taylor and No. 1-ranked Mott Community College in an 88-65 loss in the SHAC tonight. Taylor produced 31 points and five assists in only 24 minutes of action, while Kory Billups and Darryl Marshall each scored 10 for Mott (4-0). Taylor finished 11-for-19 overall from the field, 4-for-5 from three point range, and 5-for-6 from the line. Owens was led by Justin Edmonds (Albion/Albion, Mich.), who had 20 points. James Kelly (Pioneer/Ann Arbor, Mich.) was the next highest scorer with nine points and seven rebounds. The Express shot 21-for-52 (40.4%) from the field overall, 7-for-19 (36.8%) from three point range, and only 16-for-25 (64%) from the foul line. Meanwhile, Mott shot 32-for-51 (62.7%) from the field, 5-for-10 (50%) from three point range, and 19-for-24 (79.2%) from the foul line. Owens actually led 22-15 with 9:41 remaining in the first half. Mott then tied it in the next 2:29 with a 7-0 run. Following a three pointer for the Express by Edmonds, Mott then closed the half on a 14-4 run to take a 37-30 lead into the half. Following that, Mott scored first to open the second half to take a double-digit lead. Owens never closed the gap to single digits, but hung within 10-14 points most of the second half. Mott, however, stretched their lead the final seven minutes of the game. Sinclair Community College was 3-0 heading into their highly-anticipated matchup with no. 1-ranked Mott on Saturday night. The team had won its first three games of the season in blowout form, averaging a whopping 119 points per game. The form didn’t hold up against the Bears, however, as Steve Schmidt’s team cruised to an 86-68 road victory. Sophomore guard John Taylor led Mott with 35 points. The Bears led by 20 at the half and cruised to the victory. The Bears will not be back in Michigan for long, however, as the team will return to Ohio for a game against an undefeated and nationally-ranked Owens squad on Monday night. The last time a Mott guard scored 40 points in a game, the Bears won in a runaway. This time around, Steve Schmidt’s team needed every one of the 40 points put on the scoreboard by sophomore guard John Taylor as the Bears downed Jackson, 88-82. Mott, down by seven at the half, stormed back in the second half behind Taylor and his backcourt mate Darryl “Boo” Marshall. It was actually Marshall who sparked the Bears late with a 3-pointer from the left wing and some clutch free throws down the stretch. Marshall looked like a different player in the second half, playing tireless defense and pushing tempo. He finished with 17 points. Taylor was downright unstoppable from start to finish. Unlike the season opener, Taylor didn’t settle for as many outside shots. He fearlessly attacked the basket. Early in the game, players on the end of the Jackson bench were chanting “overrated” in Taylor’s direction. Those same guys spent the rest of the game craning their necks to see if he would crack 40. Some Mott fans have compared Taylor’s talent level to former NJCAA national player of the year at Mott, Jeremie Simmons (Ohio State). Ironically, Simmons was the last Mott player to score 40 points in a game. The two came from the Windy City, but that’s where the similarities end. Simmons was a greyhound; Taylor is an attack dog. Jordan Union and Larry Taylor led Jackson with 22 and 17 points, respectively. Jackson’s most impressive prospect, 6-4 sophomore guard James Johnson, struggled with foul trouble. He finished with 11 points and six rebounds. Mott (2-0) is off until November 19th when they travel to Dayton (Ohio) to take on Sinclair CC. No. 2-ranked Mott shook off some early-season rust on Saturday afternoon, outlasting an upset-minded Grand Rapids squad by five, 81-76. The Bears opened up the game sharp, leading by as many as 15. Grand Rapids did not throw in the towel early, however; the Raiders, behind sharpshooting sophomore Alex Lyle, came back to tie the game at the half. GRCC actually led by as many as seven in the second half before a flurry of baskets by sophomore John Taylor gave Mott the lead for good. Taylor, Mott’s best outside shooter, actually struggled from behind the arc (3-for-13) against the Raiders. He did, however, lead all scorers with 24 points. He also added five assists and four steals. Grand Rapids was led by sophomores Lyle and Roy Jackson, who scored 21 points apiece. Lyle hit some extremely difficult shots in this game and Jackson made his mark going to the basket. The pair both missed 3-point attempts in the final minute to tie the game, but GRCC wouldn’t have been in this one without the clutch play of those two. Walter Davis and freshman Jacob Perry added 13 points apiece for the Bears, who will host Jackson at 7:30 p.m. on Monday night. Hard to get a good grasp on exactly what Mott is at this point, only one game in and with so many new players — only two players who played significant minutes returned. Coach Schmidt has a ton of talented guards, so all is not lost. I think Mott can be a championship team once again; they will, however, have to do it differently than in years gone by. 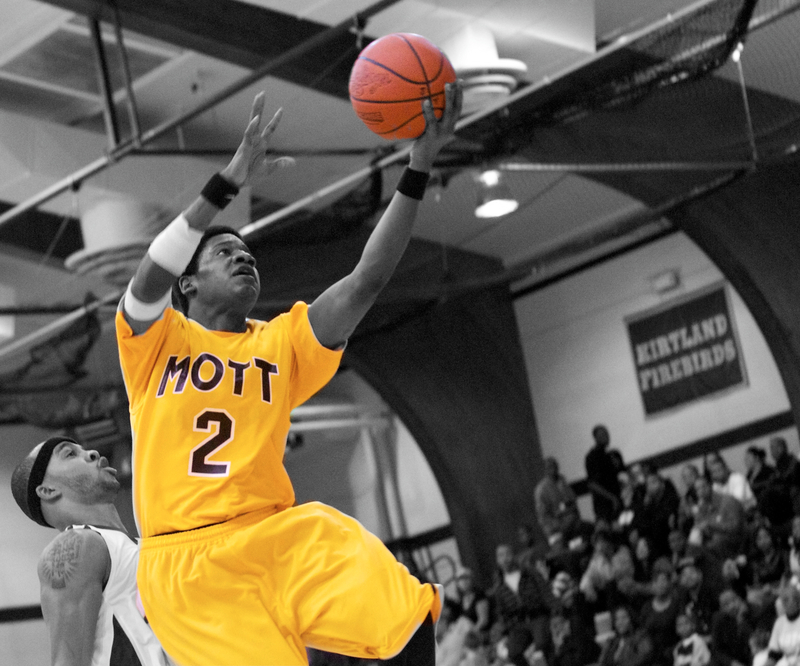 Typically, Mott has had dynamic scoring forwards and tough, defense-minded guards. This year they’ll need to get the bulk of their scoring from guards. Another upset in JUCOland last night: Owens CC, under first-year head coach Dave Clarke (former Mott assistant), knocked off Henry Ford CC. DEARBORN, Mich. — A late first half run, along with some solid individual performances, helped lead the Owens Express men’s basketball team to a 65-61 win over Henry Ford Community College Thursday night. Jay Marquette (Central Catholic/Toledo, Ohio) led the Express early. The freshman guard hit a three to start the scoring for Owens. He then proceeded to score eight of his team’s first 16 points and finished the first half with 11 points, six rebounds and two steals. Much of the first half was closely contested and back and forth. However, the Express then used a 16-4 run over the final two minutes and forty seconds to take a 39-29 lead into the half. Lansing Community College, ranked no. 11 in the NJCAA’s preseason national poll, was knocked off last night on its home floor by Mid-Michigan Community College, 75-63. I recently wrote that MMCC would beat some big-name teams this season, but I didn’t think they would get started so early. Led by Jake Blake and Tony Larkins, MMCC erased a modest halftime deficit to win by 12. This is a really physical team, which is the exception to the rule at this level. They are going to win a lot of games this year. Keep an eye on them.